It’s report card season and up and down the halls I hear teachers talking about make up tests and students saying things like, “My mom says if I don’t get my grades up she’ll…”. School Nurses are glad we’re exempt from grade stress but we mustn’t forget that we have midterms looming as well. June 30 will mark the midterm of this year’s round of New Year’s wellness resolutions and this year, for a change, I’m not dreading opening my wellness midterm reports card. What makes this year different from past years where June would find me sheepishly making excuses about why, despite the best intentions, I had given up on my New Year’s resolutions to take steps to improve my wellness? The difference is that I discovered the science and the magic of #tinyhabits. I was lucky to be part of a cohort of School Nurses who were offered the opportunity to cross-train as Wellness Coaches through the Institute for Wellness Education. Through Wellness Coach training we learned about the science of breaking complex health behaviors into their smallest building blocks called tiny habits. We learned to build tiny habits, how to anchor tiny habits to a daily activity we’re not likely to skip, and how to reward ourselves when we complete our tiny habits. Five months into my 2015 New Year’s resolution I just may get an A on my New Year’s resolution midterms. By breaking down my resolution (to practice mindfulness meditation every day) into it’s tiniest components (get the mat out, sit on the mat for 30 seconds), by anchoring the tiny habits to a behavior I’m not likely to skip (after I shower), and by celebrating every time I complete the tiny habit I have seen this tiny habit sprout and send down roots. I’m seeing the benefits of my new wellness habit at work and at home. The tiny habits approach to personal wellness is simple and elegant but it is not necessarily easy. It took many sessions with wellness coach trainers for me to learn to break those habits down to their tiniest components, to find stronger anchors to hitch them to, and to not skip celebrating success. I even pulled out my 2014 New Year’s resolution (sketch in my art journal everyday) and gave it a #tinyhabits makeover that has given it new life. Nurses across the country are discovering the benefits of cross-training as wellness coaches. The coaching skills help us in our practice with our clients and in our personal wellness as well. 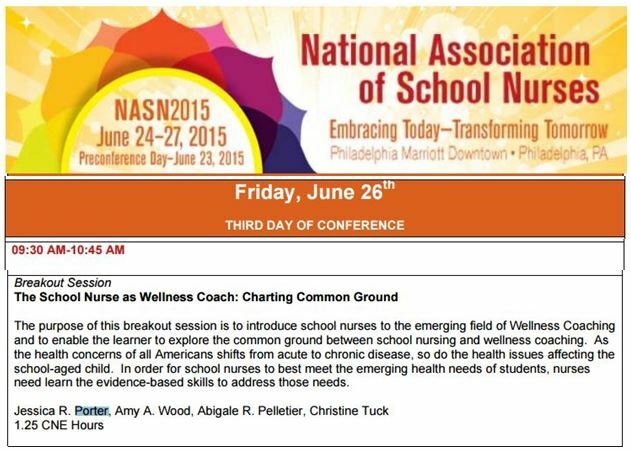 The first School Nurse as Wellness Coach cohort – Abigale Pelletier, Chris Tuck, Amy Wood and I invite you to learn more about this rewarding trend in wellness at our breakout session at the National Association of School Nurses (NASN) 47th Annual Conference in Philadelphia PA. See you there!